Once a painting is completed, most artists walk away from their work. It is finished. Done. Over. The markings have been made, the brushes washed, the images set in their spaces. The artist may consider his painting "dead." However, the energy, impulse and skill the artist applied to the painting continue to live through a viewer's experience of the painting. Cambridge artist Jim Jackson takes the continued life of art one step further. He animates his finished paintings and plays the movement of the pieces on video. When the paintings are in the same room as the video, viewers experience a multiple of viewpoints simultaneously. Jackson calls this phenomena "deconstruction of my own art," he said. Fourteen of Jackson's paintings, as well as his 15-minute painting video, "Infinity's Dance," a shorter video titled "Torso and So," and a video-in-progress are on display at the Zeitgeist this week. Alan Nidle, owner and director of the Zeitgeist Gallery, is committed to promoting local artists and to making the space in Inman Square a gathering spot for the community. Jackson lives in a Porter Square triple-decker and works in his third-floor studio. In the summer he paints outside on the back porch, which looks down over a typical north-of-Harvard-Square backyard. Three backyard paintings, "Backyard with Red," "Backyard with Blue," and "Blue Green House" are in the show. Jackson uses major key colors in his paintings. His teacher at Pratt in New York City, George McNeil, urged Jackson not to be afraid to work right out of the tube. Jackson also adds metallic and mica pigments to acrylic paints. In addition, Jackson plays with the interior and exterior surface of art by actually cutting into his canvas. The cuts create openings and holes that fold over or open, exposing a second canvas underneath. Jackson began making video of his paintings in 1980. "I had dreams of my paintings coming to life," he said. His painting videos are animations that are sometimes surreal, sometimes humorous and always engaging. He shoots his work with video and still cameras and transfers the images into a computer. With the computer, Jackson manipulates the material using six different software programs. Once an image in the painting is deconstructed, Jackson takes the essence of what the painting is and uses video technology to lead the pieces into a new painting. The paintings became characters in a film. The end result is a show of images both primordial and elegantly sophisticated. For instance, visions of Indonesian shadow dancers, the artist's brush swirling on his palette, a butterfly emerging from a hand combine to create a view of not only of how an artist creates but also how an artist dreams. The video "Infinity's Dance" animation includes images from a stained glass window project Jackson designed for collectors in Wellesley. Steve Sandburg, a New York musician, composed and performed the soundtrack, which is a mesmerizing Indian raga of chanting, guitar, bagpipe and echoes. Jackson's painting and video are on exhibit through Jan. 2 at the at the Zeitgeist Gallery, 1353 Cambridge St., Inman Square. A reception will be held Jan. 2 from 3 to 5 p.m. 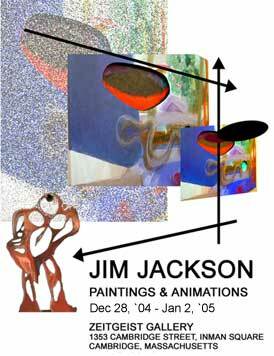 Call 617-876-6060 for more information and vistwww.jimjacksonart.com.